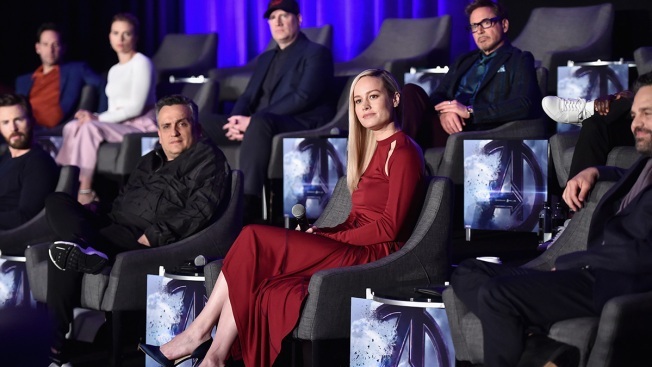 (Front) Chris Evans, Director Joe Russo, Brie Larson and Mark Ruffalo, (back) Paul Rudd, Scarlett Johansson, President of Marvel Studios/Producer Kevin Feige and Robert Downey Jr. speak onstage during Marvel Studios' "Avengers: Endgame" Global Junket Press Conference at the InterContinental Los Angeles Downtown on April 7, 2019, in Los Angeles. The long-awaited “Avengers: Endgame” is just 17 days away, and it’s already smashing box-office records left and right. Presale tickets went on sale last Tuesday and exceeded first-hour and first-day records on both Atom Tickets and Fandango. A week later, “Endgame” has done something even more impressive. In its first week, the 22nd film in the Marvel Cinematic Universe sold nearly twice as many tickets on Atom Tickets as “Aquaman,” “Star Wars: The Last Jedi,” “Avengers: Infinity War” and “Captain Marvel” combined. “Endgame” is due in theaters on April 26. The film is expected to finally give some resolution to the events of “Infinity War,” in which half the heroes disappeared into dust. It could possibly serve as the last film for several of Marvel’s most iconic characters. “We delivered millions of tickets to eager fans during the first day of presales to see ‘Endgame’ at our exhibition partners’ theaters, demonstrating there is no better place to see epic films than on the big screen,” Paul Yanover, president of Fandango, said last week. The strong advance ticket sales for the latest Marvel flick bodes well for Disney. The four films that “Endgame” outpaced in terms of presale tickets for Atom Tickets each had successful turns at the box office in the last year. “Aquaman” hauled in $67.9 million during its debut, “Star Wars: The Last Jedi” took in $220 million, “Avengers: Infinity War” earned $257 million and “Captain Marvel” tallied $153 million, according to Box Office Mojo. “Avengers: Infinity War,” the film leading up to “Endgame,” brought in $678 million domestically and $1.37 billion from international markets on its way to becoming the fourth-highest-grossing film of all time. Disclosure: Comcast, the parent company of NBCUniversal and CNBC, owns Fandango.